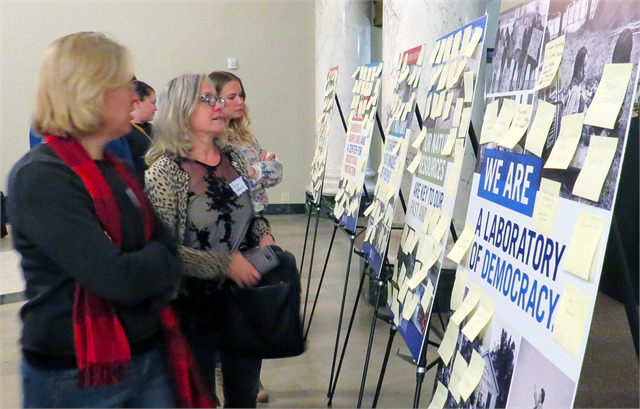 Guests look over boards filled with new museum suggestions from fellow attendees Oct. 24 at the Society's statewide engagement session at the Milwaukee County Historical Center in Milwaukee. "The comments you gave us about this first round of concept designs are really important," Society Director Christian Øverland told the crowd in his closing remarks. 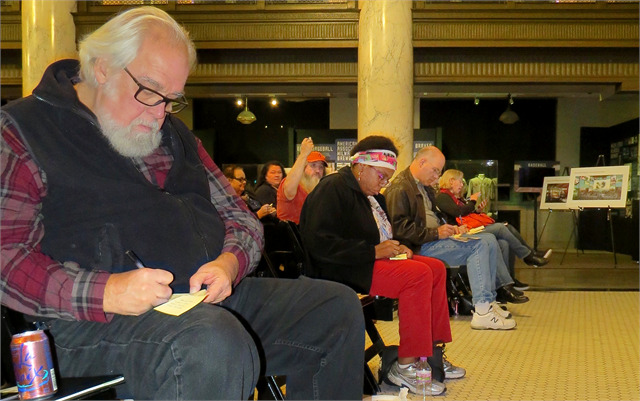 MILWAUKEE — Residents of Wisconsin's largest city got their first chance to share their thoughts about the Wisconsin Historical Society's new museum project Oct. 24 at one of more than 30 public engagement sessions being held around the state over the next several months. 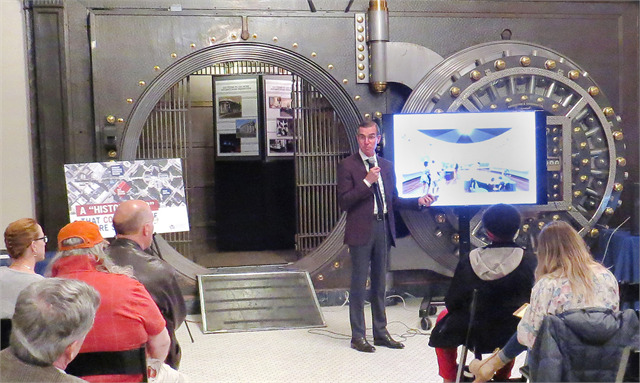 "This is a really special time for us because we're building a new museum for Wisconsin – not just a bricks and mortar project in Madison, but a museum that connects to citizens here in Milwaukee and around the state," Society Director Christian Øverland told the audience at the Milwaukee County Historical Center, a former bank building that now serves as the headquarters for the Milwaukee County Historical Society. "This is the people's museum, your museum, and we want to hear from you." Participants reviewed early exhibit design concept renderings and provided feedback, engaged in discussions about their communities, and shared ideas about what they'd like to see in a new museum and what their favorite museum experiences have been. Several guests remembered childhood trips to Chicago's Museum of Science and Industry, exploring the nooks and crannies of the museum's exhibit spaces or having the visceral experience of touring a real German U-boat. Another guest mentioned the incredible scope of the National Museum of African American History and Culture, particularly how the layout and vast collections engage all the senses and inspire repeat visits. Mame McCully, Executive Director of the Milwaukee County Historical Society, was on hand to welcome the Society to Milwaukee: "We are thrilled to host this evening the Wisconsin Historical Society as we look forward to a new museum that will represent the state's history, including ours here in Milwaukee," McCully said in her opening remarks. 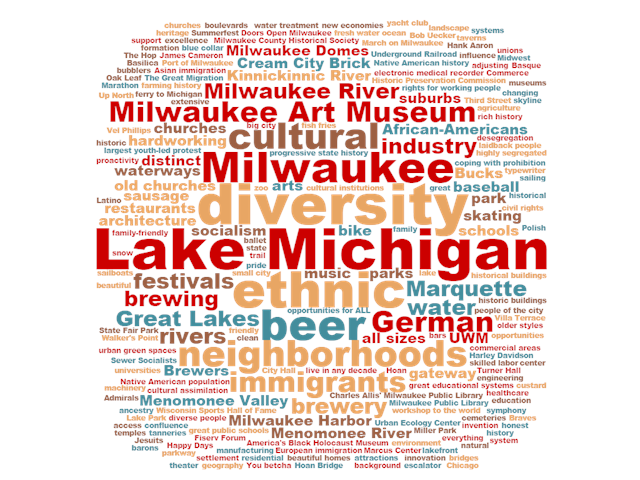 "This is important to us especially because, as the Milwaukee County Historical Society, our goal is to share the stories of Milwaukee and the people and places that make it important. We know that people are more engaged in their community, care more about it and become active when they know the stories of how it came to what it is today." McCully also highlighted the many historical partners in attendance, including representatives from the Chudnow Museum of Yesteryear, Historic Milwaukee, Inc., Museum of Beer and Brewing, New Berlin Landmarks Commission, Pabst Mansion, Waukesha County Historical Society, Wisconsin Black Historical Society, and Wisconsin Marine Historical Society. The session was led by Patrick Gallagher, president and founder of Gallagher & Associates, the exhibit design firm chosen by the Society for the project. He invited guests to use Post-It notes to write down their ideas, and dozens of ideas filled theme boards placed on easels along one side of the room. "This is an evolution, it's an iterative process, and the comments you gave us about this first round of concept designs are really important," Øverland said in his closing remarks. "Look for your ideas as we're going forward." Using Post-It notes, Milwaukee guests share ideas about the stories of their area that could be used in a new Wisconsin history museum. 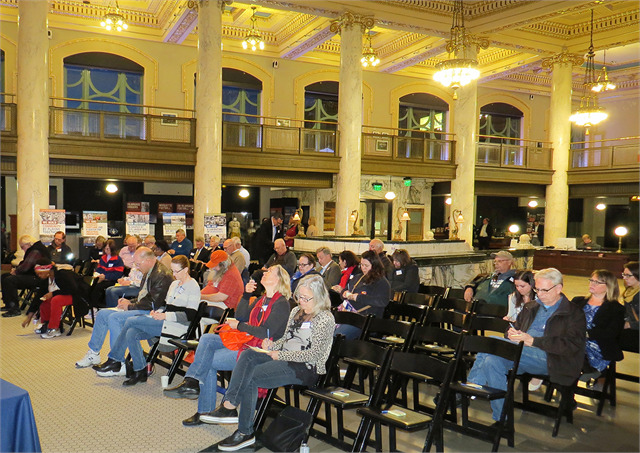 The event was held at the Milwaukee County Historical Center, a former bank building that now serves as the headquarters for the Milwaukee County Historical Society. "This is a really special time for us because we're building a new museum ... that connects to citizens here in Milwaukee and around the state," said Society Director Christian Øverland. 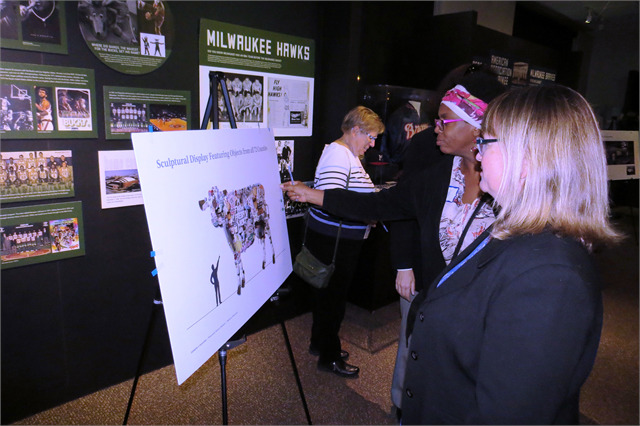 Guests review renderings of an early exhibit design concept for the new Wisconsin history museum Oct. 24 during the Society's public engagement session in Milwaukee. 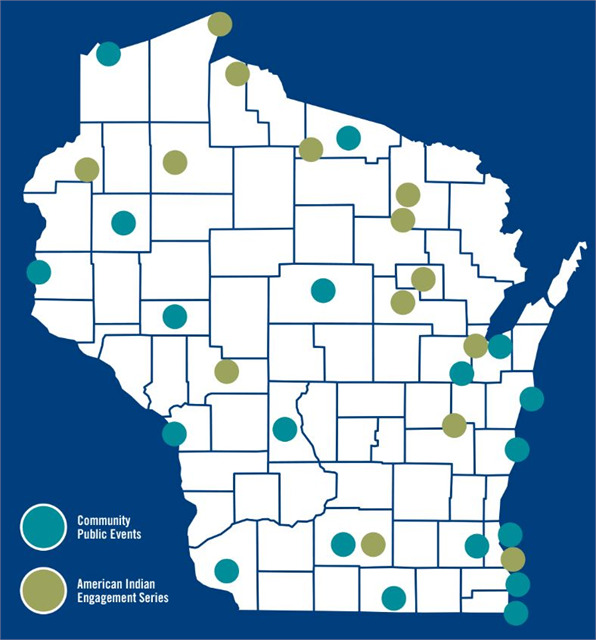 The concepts shared in the renderings are expected to change as the project moves forward and the Society collects more feedback from months of engagement sessions across the state. The session was led by Patrick Gallagher, president and founder of Gallagher & Associates, the internationally acclaimed exhibit design firm chosen by the Society for the project. Milwaukee guests filled theme boards with their ideas for a new museum and thoughts about what previous museum experiences left a lasting impression with them. Superior session word cloud This word cloud was created from Post-It note suggestions by attendees at the Milwaukee "Share Your Voice" session.